A sponsorship program is also available to those who would like to support the monks of Gaden Jangtse Tsawa Khangtsen. 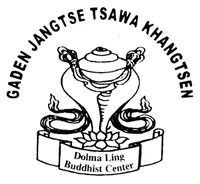 Dolma Ling Buddhist Center is a 501 (c) (3) non-profit religious organization. Our Center is affiliated with the Gaden Jangtse Tsawa Khangtsen (Monastic College) in South India. Both practice Buddhism in Gelugpa tradition. We offer administrative assistance and support for the Gaden Jangtse Tsawa Khangtsen monk's including fund-raising efforts throughout the United States and Canada. Our creed, form of worship, code of discipline, services and ceremonies are consistent with those taught by His Holiness, the XIV Dalai Lama, winner of the Nobel Peace Prize. Our mission is to promote harmony and peace among all people and within each person, and to encourage the cultivation of compassion and kindness towards all living beings. The Center organizes prayers, teachings, ceremonies, and religious discussions, as well as the creation of sacred Buddhist art.